A new Skype update was installed! Now “rebuilt from the ground up […] the best Skype we’ve ever built” (release announcement). Okay, cool. Let’s give it a go. What’s that, a crash? And it won’t be fixed because I have the wrong kind of CPU? You can tell Google Play not to update the app by unchecking auto-update. Tap the three vertical dots in the top-right corner to bring up the option. 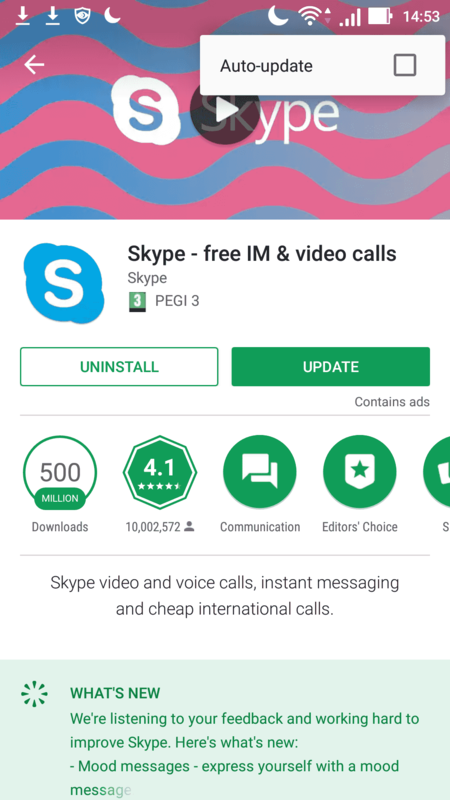 Then download the old Skype Android app from AndroidDrawer.com (“Because Newer is Not Always Better”) or any similar site. Version 7.46.0.596 seems to be the most recent version which still works on x86. Enjoy your Skyping. Or maybe just switch to Discord. It offers video chat now. Skype and I have had a decent run since ’04, but let’s face it, these past few years nothing good has happened. Take, for instance, the announcement last year that Skype for Linux was being updated again. For example, you’ll be using the latest, fast and responsive Skype UI, you can share files, photos and videos and send a whole new range of new emoticons. I have no idea what they intended by talking about “responsive UI”. The supposedly retired version 4.3 scales along just fine with DPI thanks to it being Qt-based. I guess they hope that by just tossing out random terms I won’t notice the old version already does all the things they’re boasting about. Well, except for those emoticons. Big whoop. What’s my ICQ number again? It looks like they may have actually pulled the plug from Skype 4.3 today. Alas, that probably means it’s time to “upgrade” to the version that doesn’t always manage to activate my webcam. In the meantime, Discord has gained video chat capabilities.